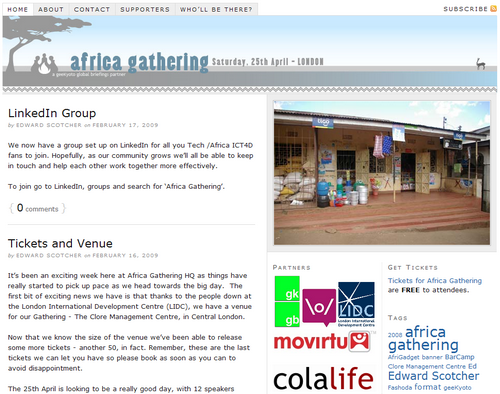 Fellow blogger CG just reminded me to mention the upcoming Africa Gathering on Saturday, 25th April 2009 (@ Clore Management Centre, Birkbeck College, Torrington Square, London, WC1 7HX, United Kingdom) which I had only briefly mentioned on the Afritwit Twitter account the other day. I btw consider this gathering a follow-up to the other two AfricaCamps which took place in Vienna, Austria and MountainView, Goolge HQ, USA some time ago. I secured my ticket for this fine event three weeks ago, but am yet to organize transport to & accomodation in London for the weekend 24-26th April. Flights from Frankfurt-Hahn via Ryanair seem to be quite affordable, but the rest is still open end – also because there are like a hundred other urgent tasks for me right now so that I am just doing it the hakuna shida / mungu akipenda way which means less planning (the German in me) and more believing in that everything will just work out fine. The list of proposed talks is already quite impressive, so it will be particularly interesting to connect with other likeminded Afriactivists. On a personal agenda, I am also still looking for a way to combine my three topics – sanitation, Africa and ICT – into a worthwile business because I am sure there’s a way to connect all of these three. will see if I can make it!! I think everyone is jealous and proud of Afromusing! That’s our girl! Also looking forward to seeing everybody again and meeting some new faces! I will be there for sure. I’m already there! Well, not exactly – it’d be a long wait. Hope to see you in April in London too, Juliana! I’m looking 4fard to that weekend too, I’l be there as well. hope 2 meet a lot of interesting people.